Over 240 GIZ technical staff working in the sectors of natural resources, rural development, transport, environment, energy and water from all over Asia recently met at the biennial “Sector Network Conference of SNRD Asia and TUEWAS” in Bangkok. 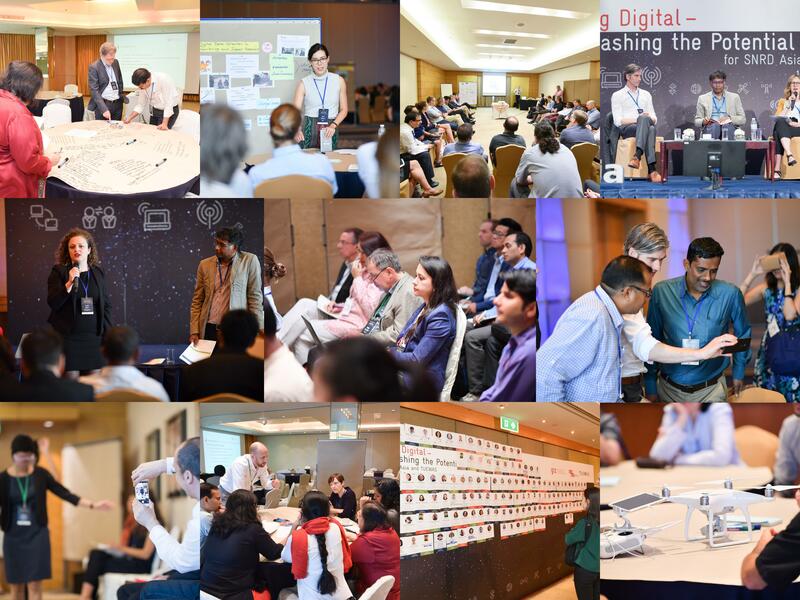 This year’s edition was held from 14 – 18 May 2018 on the theme “Going Digital – Unleashing the Potential for SNRD Asia and TUEWAS”. Key discussions revolved around: (1) what digitalisation means for development cooperation, and (2) how it enhances potential. The conference was organised for GIZ technical staff to learn from one another, build professional capacity, and promote regional and technical knowhow. For detailed description and a full list of all thematic workshops, please click here. In addition to the thematic workshops, the conference introduced participants to digital tools such as the use of drones and chatbot currently being employed by GIZ projects and allowed for an exchange of ideas on how they could be beneficial to project work. 1. Flying Robots for the Digitalisation of the Environment – Expensive Toy or Useful Tool? (by Franz-Fabian Bellot): GIZ Philippines’ Conflict Sensitive Resource and Asset Management Programme (COSERAM) has been relying on Unmanned Aerial Vehicle (UAV) devices or drones to collect high resolution geo-data. For the first time, the field acquisition of aerial images can be put in the hands of individuals, without spending large portions of financial resources for images captured by satellites or piloted aircrafts. This has resulted in a fast and efficient way of recording aerial images to support partner organisations in the monitoring of local conservation areas. 2. How to fill data gaps with chatbots (by Julia Nagel and Kajarin Yotdam): Currently being developed to fill existing data gaps in the automobile sector, the Fuel Economy Chatbot will collect real-world fuel consumption and help car drivers in ASEAN to save money and cut CO2 emissions. This chatbot has emerged as an innovative data collection tool. Wisembly, an interactive conference application, was used during the conference to engage with the audience in the hall. The application, French web-based software that GIZ is currently piloting, enabled the participants to ask questions anonymously, vote on the answers instantly, and interact with one another using their smartphones. With the conference now over, the two Sector Networks embark on a busy year ahead. For the participants, the time has come to put those ideas, inspirations and connections to meaningful use. Whether it’s a project proposal or training you are developing, make good use of your learning time here in Bangkok. For the Working Groups, it’s time to start rolling out the activities planned for the year 2018 and keep the momentum of knowledge exchange going! Lastly, in our efforts to move forward the digital discussion within our communities, a study documenting and analysing current projects that are utilising digital technologies is being envisaged. The conference was organised by SNRD Asia and TUEWAS Secretariat with the generous and active contributions of GIZ colleagues, partners and external guests. As part of GIZ’s knowledge management instruments, a so-called “sector network” is envisioned as a platform to promote peer-to-peer learning and exchange between technical staff working in the region. In total, there are 21 sector networks within GIZ which are region and topic-specific. Of prominence in the green sector are SNRD Asia (Sector Network Natural Resources and Rural Development Asia) and TUEWAS (Transport, Environment, Energy and Water in Asia). In the spirit of giving and sharing, the sector network conference brings together technical experts to discuss emerging trends of relevance to their work.